While much of the Macworld iWorld show floor is devoted to iOS and software products, there is still plenty of Mac OS hardware to be found. In particular, a bunch of companies are showing off devices equipped with the fastest external connection found on modern Macs: Thunderbolt and Thunderbolt 2. 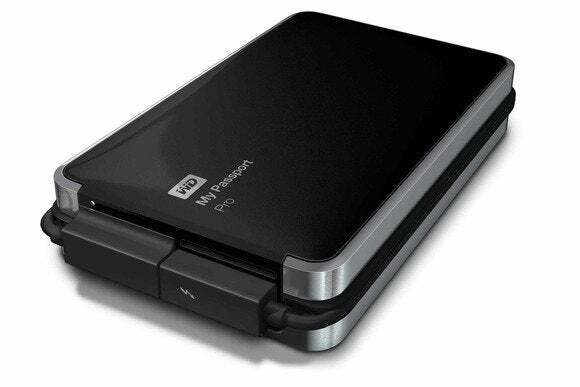 Western Digital is showing off its brand new My Passport Pro dual-drive RAID with Thunderbolt. The drive can be configured as RAID 0, RAID 1 or JBOD through the WD Utility. Using 5400 RPM drives, the drive won’t break any speed records, but the 2TB and 4TB configurations ($300 and $430, respectively) offer plenty of bus-powered capacity. Akitio has a ton of Thunderbolt products on display. One of the coolest is the Palm RAID. As the name implies, this bus-powered drive fits easily in your hand. But don’t let its small size fool you: This drive is fast. It contains two mSATA SSDs and can be configured with Apple’s Disk Utility to run in RAID 0, RAID 1 or JBOD. It comes with a short, tethered, Thunderbolt cable. In their booth, the company showed the Palm RAID reaching speeds of 717 MBps reads and up to 527 MBps peak writes. The Palm RAID is expected to begin shipping in the next week or so, and will come in two configurations: a 256GB model for $399 and a 512GB model for $649. Akitio also has the $249 Thunder Dock. This hub connects via Thunderbolt to your Mac and provides two USB 3.0 ports, one FireWire 800 port, and two eSATA ports. It has a second Thunderbolt port to allow for daisy-chaining other Thunderbolt devices. The company is also showing three Thunderbolt 2 products, including the Thunder2 Quad, a 4-bay RAID enclosure that can handle either 2.5-inch or 3.5-inch drives in a software RAID array. The Thunder2 Quad costs $449 without drives. One Stop Systems has been around since 1998, but this is their first visit to Macworld/iWorld. Their brand new Cube line of PCIe expansion enclosure range from boxes holding one short PCIe card for $450 to an eight-slot enclosure that can accommodate full-length PCIe cards that run about $1400. They can connect to your Mac over Thunderbolt or to a PC workstation of PCIe. Finally, Kanex is showing their upcoming line of Thunderbolt adapters. Shooting for a price under $100, these adapters plug into a Thunderbolt port on your Mac and provide a USB 3.0 connection (not found on the earliest Thunderbolt Macs), as well as either Gigabit ethernet (not found on the MacBook Air or MacBook Pro with Retina Display) or eSATA port (not found on any stock Mac).